Pyrenees | Pyrenees Bakery - Taste the Difference! 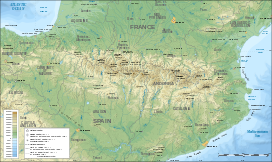 The Pyrenees is a range of mountains between France and Spain. It divides the Iberian Peninsula from the rest of continental Europe, and extends for about 491 km (305 mi) from the Bay of Biscay in the Atlantic Ocean to the Mediterranean Sea. Pyrenees French Bakery Inc. 2008 – All rights reserved.